True Thompson celebrated her half-birthday surrounded by family! On Friday, Khloe Kardashian shared an adorable photo of her 6-month-old daughter, sitting on a blanket in the grass next to Kylie Jenner’s daughter Stormi, 8 months, Kim Kardashian West’s kids Chicago, 8 months, and Saint, 2, and Rob Kardashian’s daughter Dream, 1. Also on the blanket were different sprinkle-topped cupcakes, which had the oldest of the famous kids entranced, and a big sprinkle-covered cake for the half birthday girl. 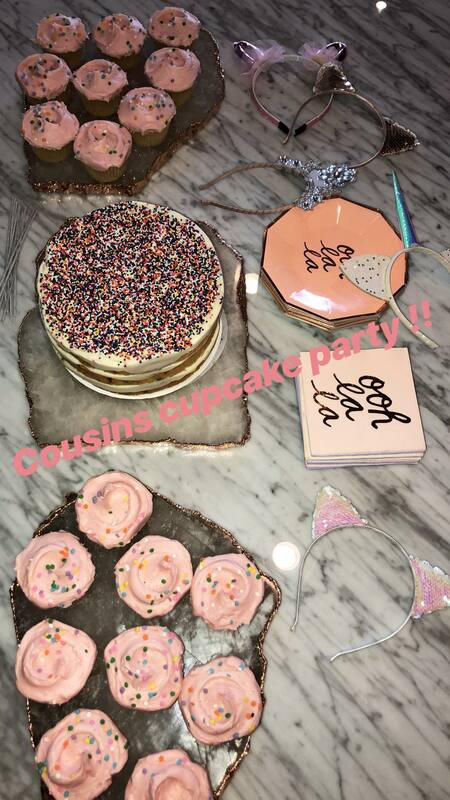 “Cousin Cupcake Party!! !” Khloe, 34, captioned the Instagram adding, “Keeping Up With The Kousins,” poking fun at their E! reality series. True’s other cousins, North, 5, Penelope, 6, Mason, 8, and Reign, 3, were missing from the sweet shot. However, Kim, 37, shared her own tribute to True hours before by posing a photo of North playing with Khloe’s baby girl. New photoshoot for Khloé denim line?